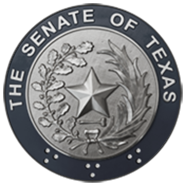 Senator Peter P. Flores was raised in South Texas, graduating from Laredo Martin High School and then attending Laredo Junior College before transferring and graduating from Texas A&M University. Senator Flores spent most of his career as a Texas Game Warden, serving the State for 27 years and achieving the rank of Colonel. In this capacity Senator Flores was responsible for a 60 million dollar budget, 27 field offices, 127 civilian employees and 532 Commissioned Texas Game Wardens with a Statewide operational scope and patrol out to 9 nautical miles into the Gulf of Mexico. Senator Flores was the first Hispanic Texas Game Warden Colonel in history. He holds a Texas Master Peace Officer certificate, is a graduate of the Governors Executive Development School from the LBJ School of Government at UT, and is a Fellow of the National Conservation Leadership Institute. Senator Flores honorably retired from State service in 2012 and is an Executive Coach for the National Association of Conservation Law Enforcement Chiefs Leadership Academy. Senator Flores was elected in a special election in September 2018, becoming the first Hispanic Republican in the Texas Senate. He lives in Pleasanton with his wife Elizabeth and has two daughters and two grandsons.